Anyway, I went to bed before 11 last night, and woke up feeling rested just before six. I made my cup of coffee, and curled up with my wurm. Note the brokeknits-esque nature of this photo. 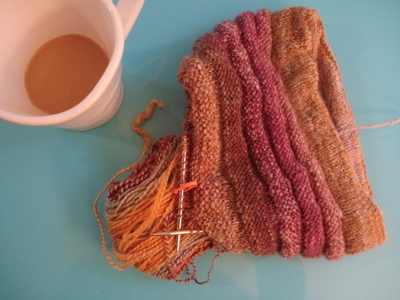 I think I’m going to knit a few more sections before beginning the decreases. I am in love with these color transitions. 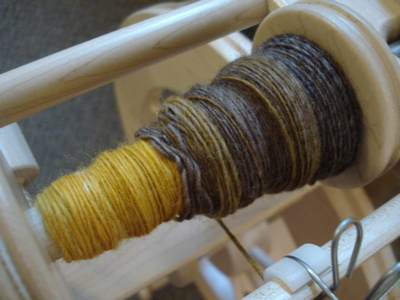 The parritch targhee 3-ply is still damp, but I’ll have finished pictures of that soon. In the meantime, I decided to put something else on the wheel. This is Hello Yarn Fiber Club corriedale in Seasick, and I’m planning either to leave this as singles OR to navajo ply this, depending on how it goes and what I want to make with this stuff. It has been awhile since I spun any corriedale, and whoa, this stuff is awesome. Just sayin’. Here’s a glimpse of some of yesterday’s organizational progress. 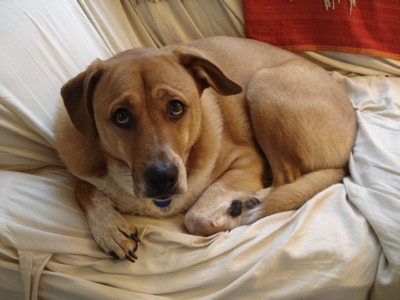 And an early-morning, rather drowsy, pouting pooch. He has no idea that in about half an hour we’re meeting a friend for a nice long walk. Tough life, big dog. 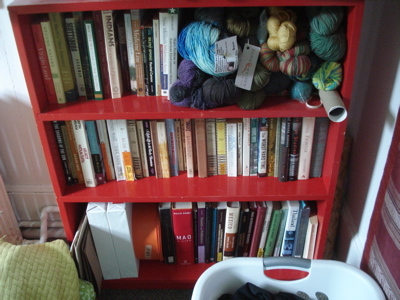 This entry was posted in knitting, spinning and tagged boh, bookcase, corriedale, handspun, hat, hello yarn fiber club, knitting, morning, seasick, singles, spinning, wurm by barefootrooster. Bookmark the permalink. Sounds like a wonderful way to start the day. The Wurm is beautiful so far. Love the wurm! It looks great in that yarn. And, as always, Boh is the cutest. The colors in the Wurm are beautiful–it’s such a happy project! Excited, as always, to see how your spinning turns out, as well! Boh has the funniest look on his face! I’ve turned into an early-to-rise person myself — completely an about-face from my high school/college days. I like to sip my coffee, go for a walk, or read some Latin first thing in the morning. Gorgeous Wurm! I love those colors., esp. against that blue table. Oh Boh. You kill me. I love the oranges against the blue! One day, I aspire to be an early bird. It seems so peaceful.